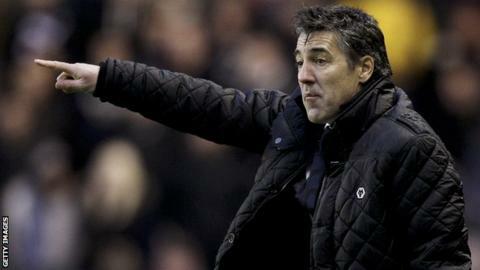 Ex-Wolverhampton Wanderers boss Dean Saunders says he is ready for a return to management after almost a year out of the game. The former Wales striker was sacked by Wolves following their relegation to League One last season. Following a prolonged break, the ex-Liverpool and Aston Villa player is eager for more work. "I've had a rest and I'm now ready to get the right job," Saunders told BBC Radio Wales Sport. Saunders served as assistant manager with Blackburn Rovers, Newcastle United and Wales before he launched his managerial career with Wrexham in 2008. He spent three years with the Conference club before he was appointed Doncaster Rovers manager in September 2011. Swansea-born Saunders failed to save Rovers from relegation to League One at the end of his first season in charge. In January 2013 he left the club to succeed Stale Solbakken at Wolves, but was sacked after only three and half months in charge following the club's relegation. But Saunders believes he has learnt from his previous managerial posts and is hoping to make a return this summer. "I didn't have time to do what I wanted to do at Wolves. I don't think anybody [in] three and a half months has got time to do anything," Saunders said. "You learn all the time. I've learnt a lot after being at Wolves and learnt a lot at Doncaster and Wrexham. You pick things up. "I've realised now that I need a job where; it doesn't matter what level it's at really - everyone's pulling in the same direction and we're all thinking the same way. "I've walked into three disaster zones, the three jobs I've had, just trying to salvage something when the clubs are in a mess. "But if I can get a pre-season with the team and you can iron out things… then that's obviously the best scenario to walk into. "Ideally, I'd like to take a job at the end of the season, but beggars can't be choosers. "Everybody wants a job in football and sometimes you've got to take jobs and take the risk and have belief you can sort it out."